A speeding ticket is the most common form of traffic violations that traffic lawyers and paralegals see in the Provincial Offences Court. 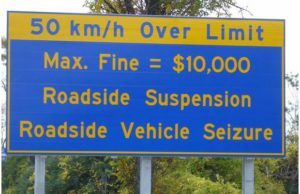 A speeding ticket can vary in penalty, and carry hefty traffic fines the greater the rate of speed is, over the posted limit. For a FREE Speeding Ticket Consultation Call us at 647-528-5422 or submit your speeding ticket through our website. Because of the severity and consequences associated with these traffic violations , it is important to consider fighting your traffic ticket. Instead of just paying the speeding ticket online, you may want to reconsider your legal options. Police officers today are using a variety of methods to measure your alleged rate of speed. Police Officers can enforce speeding with radar guns, speed laser devices, aircraft enforcement, and pacing. It is important to have the knowledge, experience and know how to fight your speeding tickets. At Lighthouse Legal Services, Brian Morris has the experience to defend your speeding ticket. He has defended thousands of driver’s who have been charged with traffic violations stemming from radar guns, speed lasers, officer pacing, and aircraft traffic enforcement. We can guide you throughout the legal process in traffic court to ensure you get the best legal defense in Ontario, while educating you throughout the legal process. Will help you try and avoid those demerit points, traffic fines, and possible suspensions. Lighthouse Legal Services offers a Free 30 minute initial Consultation. We have the experience to help you ! 50+ over the limit carries 6 demerit points. Stunt Driving Charge can be issued with a 7 day roadside suspension and vehicle impound. Upload a copy of your ticket(s) below. You can upload up to 10 tickets. Upload a picture or copy of all your tickets. Make sure to include the entire ticket in your picture. I highly recommend Brian for any of your traffic ticket questions and legal services. He answers all questions in lamens terms, easy to reach and very responsive. Give him a call! Superior service ! Highly recommended to anyone who need to fight off their traffic violation tickets. Brian helped me to win the case and had successfully withdrawn both demerit points & fine that were originally charged against me. Thanks to Brian, my insurance premium will not be affected when it's due for renewal next year. Two thumbs up to Lighthouse Legal Service, Aurora ON !! Brian from Lighthouse Legal Services did a great job in reducing my speeding ticket. The process was very simple: After calling Brian to explain the story, I sent him my details, he gave me my options and from there everything was taken care of. Based on my positive results I highly recommend Brian at Lighthouse Legal Services. Hopefilly won't need to but would not hesitate to use him again! With 33 other reviews before mine and a perfect score of 5 stars throughout them all, I can undoubtedly say that I completely understand why! The team at Lighthouse is tenacious, forthcoming, fast and incredibly knowledgeable in their area of expertise. Lighthouse took care of everything for me from start to finish. Brian kept me in the know for the entire time and was quick to reply to any emails and calls with all the answers to my questions. I had shopped around elsewhere for quotes for quite some time before finally finding the right fit for me. Their price was impossible to beat! If you go elsewhere, you'd be wasting your time and money. I plan on using Lighthouse in the future and highly recommend them to anyone looking to find the best price for such impeccable service. Heres to another 5 stars! Brian and his team were amazing. They took the time to keep me informed and updated at all times. Courtious and efficient i would recommend Lighthouse legal. Thank you Brian. Brian was such a help for me when I was involved in an accident. A very calming person to reach out to when you're stressed out! Very pleased with all the help. I hope no one has to use the service, but he is who you should reach out to if you need to! Brian and his team were extremely helpful and informative. I would recommend his services, and would not hesitate to use Lighthouse again. Brian was fantastic. We needed Brian’s help in dealing with a ticket for our son. He was extremely professional and knowledgeable. He handled everything and kept us updated throughout the process. We couldn’t have been happier with the outcome! We would rate him a 10 if available! Thanks again Brian. Brian provides expert, professional and timely advice. He puts his customers above everything else and highly recommended. Amazing work from Brian at lighthouse...Very strong communication throughout the process and informing me on anything I wanted to know. He was happy to be doing the work and had a price that was impossible to beat. You will not be disappointed working with BrianThanks for the great work! Brian is amazing at careless driving tickets. I highly recommend him for any traffic ticket. Brian is EXTREMELY smart, nice to deal with and experienced. He is professional, ethical and worth every penny! SUPER QUALIFIED! Very experienced, honest and knowledgeable. Highly recommended. I wish I knew Brian 10 years ago. He is an professional and simply one of the best. He was able to help my wife and myself get out of two very costly tickets. I’m still in awe of what he was able to do. I thank God for using him to help us. After all of that, he gave us a written report and some add advice on how to move forward. I highly recommend them. Thanks so much. Blessings. Great Job! Very professional, knowledgeable and looked after everything. Best of all, Brain had the case withdrawn. Even provided a written report on the day of the trial. I didn't have to follow up, he sent me an email. I would definitely use "Lighthouse Legal Services" again. Dude make my day! He is professional, knowledgeable, passionate and talented. I knew it was in more than capable hands! AMAZING service! Thank you Brian! - well deserved 5 star rating! Thank you Brian for helping us Fight and Win our Careless Driving ticket. It was clear from our first conversation with you, that your an expert when it comes to Careless Driving cases. I would definitely recommend you to anyone I know. My family has used Brian's services on two occasions. He helped us in many ways and the results were better than we had expected. He was professional, honest and respectful at all times. Thank you Brian!! Brian handled a "failing to stop for a red light" charge I had while driving my motorcycle. We went to trial, with a very unique case. Brian found a vaguely similar case in BC and was able to get the case dismissed! He's a fantastic lawyer and amazing in the court room. The prosecutors were not happy to lose this one. He knows his stuff. And seems to enjoy his work. They are open on Saturday so that is a huge plus, no missing work to get things started. I've utilized one of the competitors before and I felt like I just handed several hundred dollars to a corporation that didnt know my name. It was like i was just the sum of my speeding ticket. All they did was take my money and pay my ticket. With Lighthouse you're getting professional legal services and you won't feel like you're just a court date. The prices are very reasonable and I got to talk with the guy who actually handles the case. Brian at Lighthouse Legal is extremely professional when representing you for any and all traffic cases. His dedication to each case, legal knowledge, and professional yet friendly demeanor made the whole process extremely easy on me. Give them a call if you are ever in need of legal advice. You won't be sorry! Brian is very professional and helpful. With just one phone call and a few emails, he was able to get my case dismissed. I highly recommend his services and he will be my first call if I ever need a lawyer again. Thanks for the great service! The Lighthouse legal team is great. I highly recommend their service if you are ever in need. Brian is a very personable, relatable, and caring attorney, that I turn to for help and guidance knowing I’ll be treated fairly and spoken to evenly; without the typical nonsense and jargon that follows many legal services experts. Does great work and provides fantastic service. Brian has been more than helpful for any questions and concerns I had regarding traffic tickets. He always made himself available; you could reach him at anytime of the day. His knowledge of the law succeeded in getting me completely off of all my tickets. I highly, highly recommend Brian Morris. Brian is very passionate about his work and will fight for your rights. You won't go wrong by working with him. Excellent customer service! Never going anywhere else! Thanks Brian for taking care of everything! Helped me with 2 separate tickets now. Very professional and a very smooth process. I won't be going anywhere else with my legal affairs. Currently utilizing Brian's skills. He is very professional and has everything done immediately without hassle on my side. Brian always follows up on the status and provides key guidance on how to move forward with advantageous results compared to other professionals. I am so fortunate to have asked Brian for his unmatched assistance! I could not recommend anyone better! Thank you so very much Brian! 5+ *!